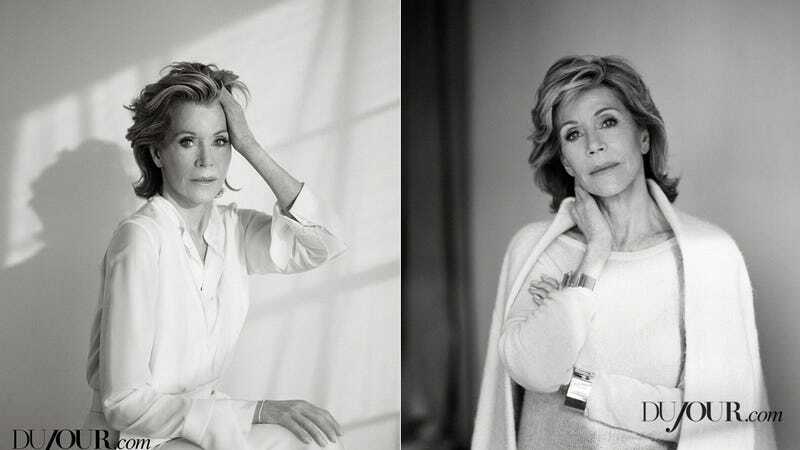 Jane Fonda was recently interviewed about her new Netflix series Grace and Frankie (which co-stars Lily Tomlin!) by DuJour.com and, unsurprisingly, the ever-interesting actress was full of fascinating insights and anecdotes on subjects ranging from relationships to plastic surgery to being an older woman in Hollywood to feminism. Jane Fonda is telling me about the night she won her first Oscar, in 1972, for her role as a reluctant prostitute in Klute. "I wore a Saint Laurent wool suit—black," Fonda says, in disbelief. "A Mao wool suit that I'd had for five years. I never had a stylist. I didn't know you could get someone to come and do your makeup. I thought you had to buy a dress." It's mildly hard to believe that Jane Fonda, daughter of actor Henry Fonda, could be so naive about the workings of celebrity and awards season, but oh, well. It's a charming story, regardless. When Jane Fonda left her third husband, CNN founder Ted Turner, in 2001, he wasn't just hurt, he was flat-out confused. Fonda recalls Turner telling her, People aren't supposed to change after 60. "I think about that all the time," she tells me, sipping her tea. "He has hardly changed. And I feel like a different human being." "The first week I was dating Ted there was this big rally in Hollywood and my job was to introduce Virgin Airlines…"—she pauses to think of his name—"Richard Branson. So, I introduced him. He came up. I started to leave the stage, and he grabbed me and he pulled me back. He said, 'You really owe me.' I looked at him. And he said, 'I was 15 when I was circumcised. I still had the stitches in when I watched Barbarella. And you made me burst my stitches!" She laughs, adding: "Isn't that a strange thing to say in front of 3,000 people?" "People always say, Oh my god, how do you stay looking so blah blah blah," Fonda tells me. "I've had plastic surgery. I've talked about that. That doesn't matter." "What matters is realizing you can always get better. That you have to keep taking leaps of faith. It gets harder as you get older. You have to stay brave and keep trying to go beyond your comfort zone and see what you need to get to become who you're supposed to be." She can't believe we're still talking about equal pay 35 years after Nine to Five. "I said that at the Kennedy Center Honors when I was honoring Lily," Fonda recalls, "but they cut it. Talking about equal pay was too far out for [producer] George Stevens." "I'll smoke pot every now and then. I cannot see a movie on pot. The number of movies I've seen thinking, This is probably the best I have ever seen, and then I'll see it again sober and think, What was I thinking?" Looks like you and Jane have something in common after all.